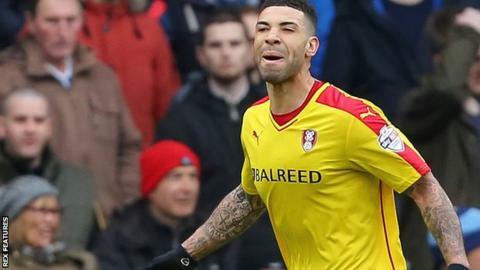 Leon Best's third goal in two games helped lift Rotherham out of the relegation places with victory over play-off chasing Ipswich. A Matt Derbyshire break and a miscued finish from the unmarked Best put the Millers ahead late in the first half. Rotherham's Stephen Kelly then cleared a Freddie Sears shot off the line and goalkeeper Lee Camp denied Ipswich's Daryl Murphy early in the second half. Ipswich had a late chance to level, but Ben Pringle's ball flashed across goal. Victory saw the Millers move up to 20th and out of the relegation zone for the first time since Neil Warnock's arrival as boss in February. But Mick McCarthy's Ipswich have slipped four points adrift of Sheffield Wednesday in sixth spot, with the Owls consolidating their play-off spot by beating strugglers Charlton 3-0. There was a flurry of goalmouth action before the interval at Portman Road with Ipswich's Luke Chambers denied by Camp, whose opposite number Bartosz Bialkowski pushed away a low Grant Ward effort at the other end before Rotherham scored their winner. Kelly twice thwarted Ipswich after the break, getting behind Sears' shot before getting a touch on a Christophe Berra header. On-loan Bolton winger Liam Feeney made an energetic introduction for Town, twice finding Jonas Knudsen, while a late push forward by the debutant eventually forced a chance for Pringle to smash across goal, which Berra just failed to divert into the net. Ipswich manager Mick McCarthy: "We deserved to get booed off. It was a poor performance but I take a big part of the responsibility for that. "I left the team as it was on Tuesday (a 2-0 win over Blackburn) when in hindsight I should have changed it. "Maybe they didn't have the legs or energy. But all round the side, and I include myself, none of us came out of that with any glory." Rotherham boss Neil Warnock: "I thought we deserved the win. We were so solid at the back and restricted them - our goalkeeper didn't have shots to save. "Overall, our lads have done ever so well. We are limited but the Championship is my cup of tea. "I have come here for 14 matches and I am loving it. I don't feel under any pressure and I have asked the lads just to give me their best. "Leon Best has come in and I think he is the only player on that pitch who could have scored that goal - it was a better one than what people might think." Match ends, Ipswich Town 0, Rotherham United 1. Second Half ends, Ipswich Town 0, Rotherham United 1. Attempt missed. Ben Pringle (Ipswich Town) left footed shot from the centre of the box misses to the left following a corner. Corner, Ipswich Town. Conceded by Greg Halford. Attempt missed. Grant Ward (Rotherham United) left footed shot from the centre of the box is high and wide to the left. Assisted by Greg Halford. Corner, Ipswich Town. Conceded by Grant Ward. Attempt missed. Kirk Broadfoot (Rotherham United) header from the centre of the box misses to the left. Assisted by Richard Smallwood following a set piece situation. Substitution, Rotherham United. Jonson Clarke-Harris replaces Leon Best. Corner, Ipswich Town. Conceded by Joe Mattock. Foul by Grant Ward (Rotherham United). Substitution, Rotherham United. Joe Newell replaces Matt Derbyshire because of an injury. Delay in match Matt Derbyshire (Rotherham United) because of an injury. Substitution, Ipswich Town. Kevin Bru replaces Luke Hyam. Substitution, Ipswich Town. Ben Pringle replaces Brett Pitman. Leon Best (Rotherham United) wins a free kick on the right wing. Attempt missed. Brett Pitman (Ipswich Town) right footed shot from outside the box is high and wide to the right from a direct free kick. Attempt blocked. Matt Derbyshire (Rotherham United) right footed shot from outside the box is blocked. Assisted by Lee Frecklington. Lee Frecklington (Rotherham United) wins a free kick in the defensive half.